Last week was a busy week and the kids ended up eating lunch from school catering. But starting this Monday until the end of the month, I will make bento for the kids with a variety of characters from San-X. On the weekend, the kids and I had been browsing to find some of cute characters that would be applied for bento. They seeemed excited and so did I.
MIKAN BOUYA was the first character that I chose to make this morning. Mikan Bouya is a cheerful Orange Boy and he has a lot of friends. He and his friends enjoy so much hanging out together, having a tea party, cooking, going to picnic or just cleaning up the house. They always have fun together. I also made Pichirou (Peach Boy), one of Mikan Bouya's friend. Inside the box : strawberries, baby cucumbers & tiny flower shapes carrots, crispy fried chicken skins, kamaboko, baby corns & edamame skewers. Hand molded rice with the shape of Mikan Bouya and Peach-Rou. The orange color was from tomato sauce mixed with rice and the yellow color was from egg mixed with rice. So cute! I especialy like the cucumber and carrot details. It's nice how you find your inspiration together with your kids. What a "cool" mom! 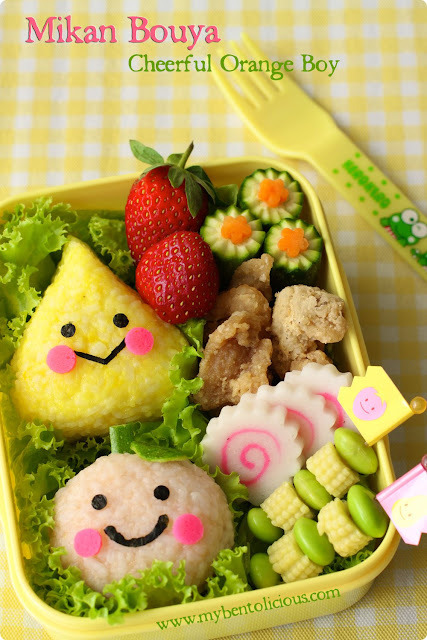 This bento is so cheerful just seeing it has brightened my day. so cute! How much time did you need to do this??? If I were to do rice balls, it will probably takes me at least an hour to mold the shape! @sherimiya : I was cheating, using the decorative knife to make that cut on baby cucumber hehehe ... Thanks a lot Sheri! @Alice : This bento only took 30 minutes to prepare. I always do the quick one for Monday morning. Thanks a lot Alice for your comment! This is so cute. I don't anything about San-X. Must ask the boys maybe one of them will request a birthday cake on this. Lovely, bright and sunny bento--just beautiful, Lia! How cute! I am not familiar with San-X but these are adorable little bento creatures! @Jenn : San-X has a lot of cute characters. You can browse it here SAN-X JAPAN. Thanks a lot Jenn! The egg colored the rice perfectly, I would have never thought of that!